Managing your My Business listing is free. Google wants to provide high-quality, relevant information to its users so it does not charge companies who wish to help in providing this kind of info. In that vein, companies with a more complete listing enjoy higher search rankings. Google can be more assured that your company information is up-to-date and accurate when you are actively participating in providing it. A My Business listing also takes up a large portion of the results screen. 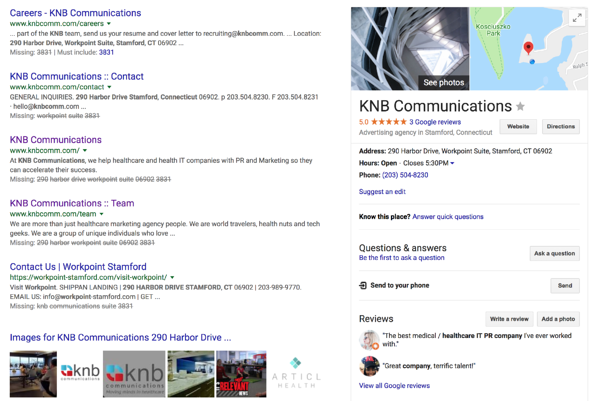 When someone searches for your company, your healthcare company (and not a competitor) is taking center stage. Your listing will also appear if someone searches via Google Maps. These are actionable insights. You can work the most relevant keywords and phrases into your blog posts, your meta descriptions, and other content to help searchers find your company even more easily in the future. You’re able to put your best foot forward by fine-tuning your listing with up-to-date information and visuals. People are able to process visual images much faster than text. People can get an immediate feel for your company and brand when you carefully choose appropriate visuals to represent your company. Google MyBusiness also allows business owners to respond to reviews of their company. By responding to reviews (even negative ones), your healthcare company will appear connected to their customers and concerned about the user experience even after the fact. The transparency and messaging used in this platform will build strong brand equity and even loyalty. A new feature on MyBusiness allows companies to make posts about “what’s new.” These posts will appear prominently in the listing for two weeks before being saved on the listing less conspicuously. For some companies, this might be a good place for highlighting a sale or an upcoming event. For our healthcare clients, this is the perfect place to showcase a PR placement, an award, or upcoming healthcare trade show information.